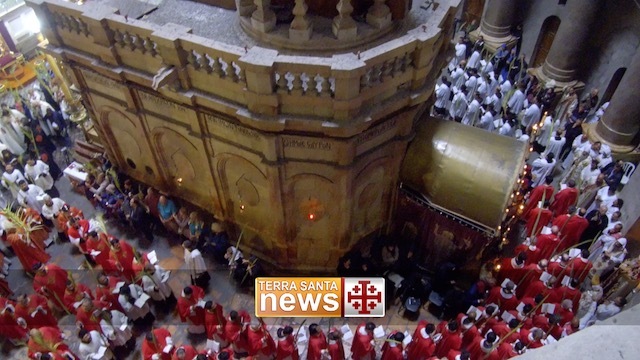 Since 1342, when Pope Clement VI, with his bull, gave the Franciscans the task of protecting the Holy Sepulchre of the Lord, the Holy Cenacle and the other Holy Places across the sea,” the Custody of the Holy Land has committed, in the name of all of Christianity, to recovering and caring for the Holy Places of our Redemption. Their tasks include holding mass and prayer services and providing spiritual guidance to pilgrims and local Christians. This “time-honored” task and the Franciscans’ love for the Lord’s homeland translate into intensive theological and archeological studies of the places and of the Bible. The “Studium Biblicum Franciscanum,” the Center for Biblical Studies and Theology in Jerusalem, is a central part of this. A significant part of the task of protecting the Holy Places is an obligation to spreading the spiritual message conveyed by the Places, which bear witness to Jesus Christ’s salvation of mankind. The Holy Places are visible expressions of history, faith, and mercy in the Holy Land and the destination of pilgrims from all over the world. The Franciscans of the Custody of the Holy Land fill their Holy Places with life, pray for pilgrims and their concerns, and represent Christianity and especially all those who cannot make it to the Holy Land, so they can also receive the mercy found in and emitted by every sanctuary and Holy Place. These Holy Places, significant for both culture and faith, have so much value for Christianity that they were called the “Fifth Gospel” by Paul VI.